This is pretty basic, line of sight radio communication that is vital on a boat. We’re going to install a Standard Horizon GX2000 VHF at our nav station, and a Ram3 Remote Mic up at the helm. 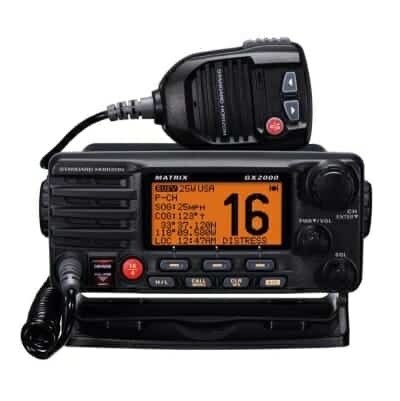 This will allow us to radio other boats without having to leave the helm and still listen to VHF channels inside the boat. These two units can also be linked together and serve as an intercom system. Perfect for requesting hot chocolate from the helm on a cold night! 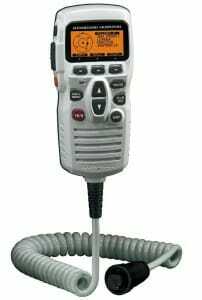 We will also have a Standard Horizon HX851 handheld VHF on the boat that will give us walk around freedom and can be used with AA batteries in case we have to abandon the boat. To start out, a satellite phone will be a major backbone of our communication systems. It provides an easy way to do voice calls, and can also be used for data transmission, which in our case means emails. Data speeds via sat phones are incredibly slow so we won’t exactly be reading CNN or laughing at the latest LOL Cat email, but if you use an email service that provides compression, text emails can be sent and received relatively quickly. We plan to use emails to receive weather information, so this will be an important function for us. I will cover some of the email services that I’m evaluating in another post. 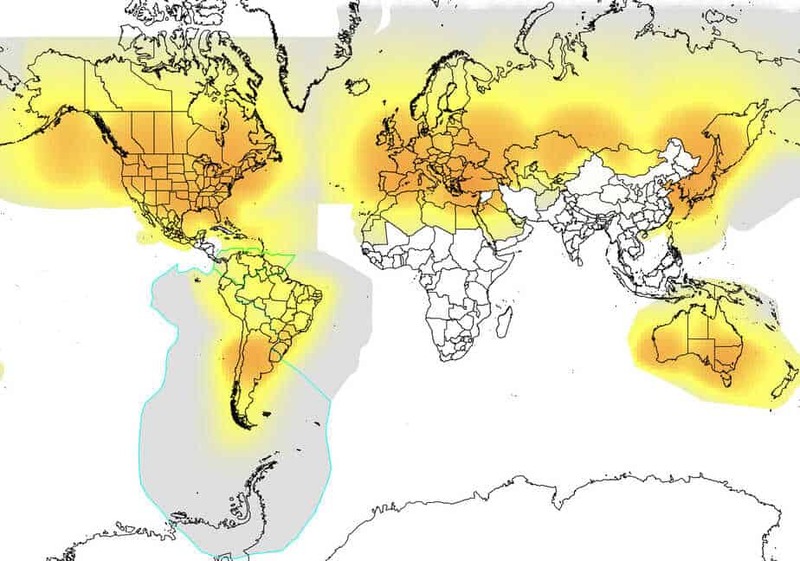 The other important thing consider is the coverage map. This isn’t quite like the early 2000’s cell phone plans where if you wandered out of your service area you paid large roaming charges. With a sat phone, if you are out of the coverage zone, you won’t be able to make any calls/send any emails. That can be a big problem if you’re in the middle of the ocean and need your phone. 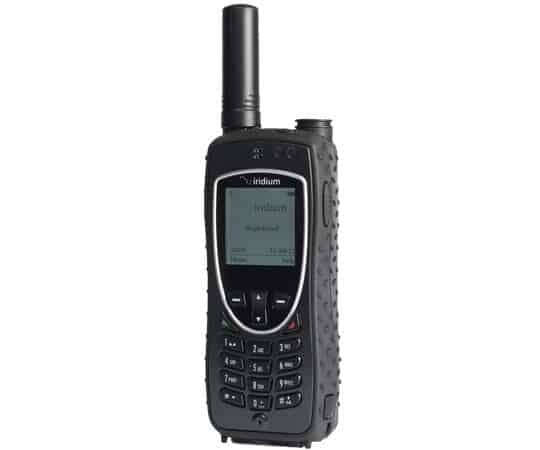 Equipment: Iridium has a pretty good selection of sat phones. The latest, and what we’re buying, is the 9575 Extreme. This is a pretty rugged phone, offering GPS positioning/tracking and text messaging in addition to voice calls and voicemail. It also has an SOS Emergency Button that will be one more backup to the EPIRB we have on board. We intend to keep the phone at our nav station and will determine if we need an external antenna to provide a good connection once we’re on the boat. Data Speeds: The Iridium handheld data connection tops out around 2400 bps. So remember those impossibly slow 14.4k modems? Yeah, ours will be even slower. If there was ever anything in life that may be able to teach me patience, this will likely be it. Fortunately, the use of an email service that provides compression will increase things somewhat, but there will be absolutely no broadband internet using this method. Coverage: This is where Iridium really shines. They have a system of 60 low-orbit satellites that offers coverage effectively worldwide. Since we plan to eventually undertake a circumnavigation, this was an important concern of ours. Reviews I’ve read also said the low-orbit satellites mean the communication lag is minimal and it feels more like having a regular phone conversation. 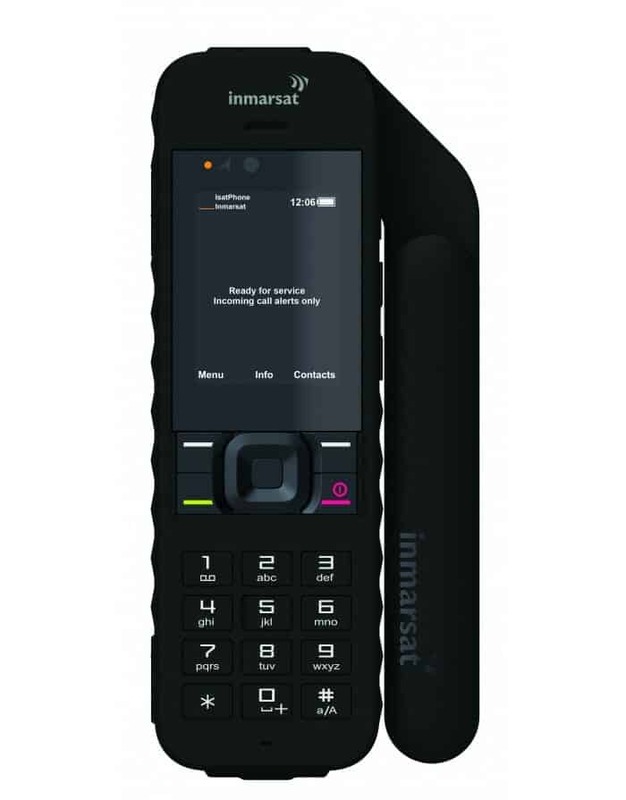 Equipment: The latest offering from Inmarsat is the IsatPhone2 which again has been designed to be a rugged phone for the elements. It offers impressive battery life as well as similar features to the Iridium Extreme. In all honesty, the equipment was not the deciding factor in our decision as both seem to be high quality. Data Speeds: Finding reliable reports of data speeds for these networks is a bit of a challenge, but I did find a few references to data speeds of around 1200-1500 kbps and several threads on Cruisers Forum referenced that the Inmarsat data speeds were slower than Iridium. I’m aware that “fast” is a relative term in this instance, but going with the quicker network is what tipped this decision. 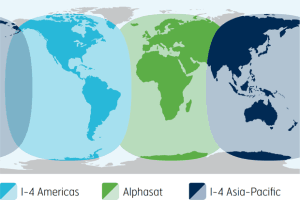 Coverage: Inmarsat offers effective worldwide coverage, excluding the poles. Since we aren’t really planning on communing with the polar bears or penguins, this wasn’t such a big deal. However, the reported lag time due to the height of the satellite network was a concern. Coverage: The coverage offered by Globalstar ruled this one out immediately. They have significant holes in their coverage once you get away from the coast which means I don’t think its very well suited for significant marine use. We really like some of the blogs we follow (such as Two Fish) that have integrated maps showing where the boat has been. And as we’ve discovered, there are lots of ways to do this. I’m going to break it down into two categories, software and hardware. Spotwalla: Spotwalla is an awesome, free, personal location manager that offers support for multiple devices. It will integrate into our website allowing us to share where we are in real time. That will be prefect for those poor friends of ours who have to wait at a beachside resort while we sail to meet them. 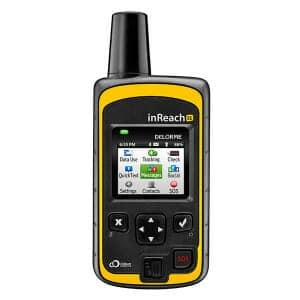 DeLorme inReach: We decided to go with the inReach SE, which is a “satellite communicator” that utilizes the Iridium satellite network and its 100% global coverage. That means our parents won’t start worrying because we hit a coverage dead spot and lose tracking updates. The inReach SE will primarily serve as our tracking device and can send updates every 10 minutes if we so desired. It also can do text messaging and has an SOS feature as yet another backup. The negative is that it does require a service plan in addition to the hardware costs, but the automated ease of use, integration into Spotwalla and global coverage made it worth it. SPOT Personal Tracker: This is a much simpler device (no screen) that offers very similar features to the inReach SE. 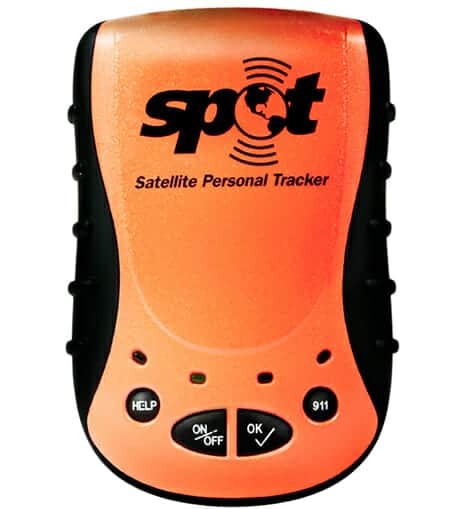 However, the disqualifying factor of the SPOT Tracker is that it runs of the Globalstar network and while the messenger has better coverage than the phones there are still significant gaps. So while it may be cheaper, it was ruled out quickly. Iridium Extreme Email: Spotwalla offers a method to update your location via email by sending them an email in a certain format detailing such items as your Latitude, Longitude, Date-Time and other options as well. This would allow us to use our Iridium sat phone to send an email, but it would be a manual method of updating and wouldn’t be ideal. Everything I read makes it sound like the world is getting smarter and locking up their wifi. Bummer for us. However, there are still opportunities to grab land based wifi signals for a cost, or that rare glorious unlocked wifi signal. So because of that, we are going to have a bitstorm Xtreme system installed on the boat when we get to Florida. It was recommended to us and was highly rated by Practical Sailor. With up to 7 mile range and 100+ Mbit connection speeds, it is our best hope of catching that streaming soccer match. Believe it or not, there will be a place for a cell phone in our communications plan. We’ve been dedicated iPhone users since their inception and fortunately still have some our previous models. The iPhone 4 has a regular sized sim card (our current iPhones have the mini-sim card) and can be easily “unlocked” by AT&T since it is out of contract. That means we’ll be able to buy a sim card once we enter a country and have voice and data access. The phone can be set up to be used as a wifi hotspot and thus will be another internet option for us when we’re close to land. Plus, we want to be able to communicate when we’re on land so having a cell phone to call each other or local businesses will be extremely useful. 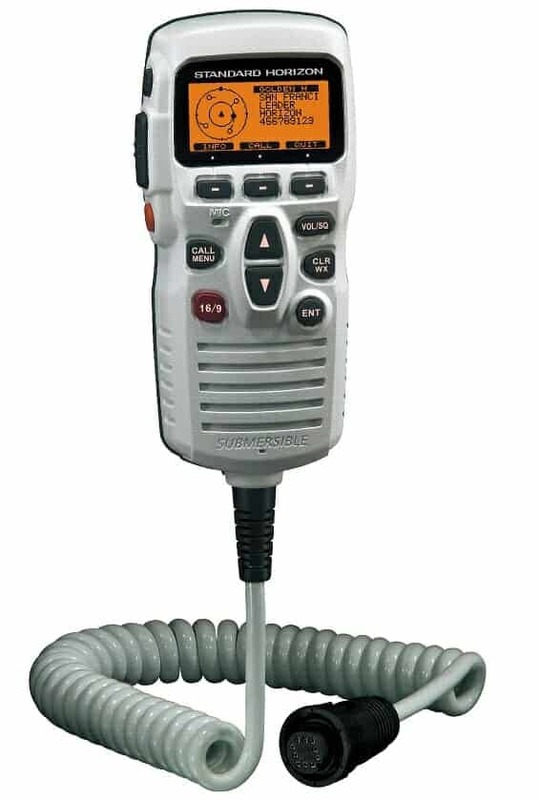 The single side band radio has long been used by cruisers to satisfy most of their communication needs. When you combine an SSB with a Pactor modem, you can download email, just like we will be able to with our Satellite Phone. There are also ways to make phone calls using SSB and a land based service, but this isn’t as plug and play as a sat phone, nor could it be taken with us if we travel or have to abandon ship. The big advantage I see for SSB is the community they provide, as cruisers nets are very popular. The significant downside to SSB is the upfront equipment cost which isn’t cheap. Since I have zero prior experience with these systems, we’d also likely need a professional to install it for us as well. We’re going to wait on SSB and make the decision once we hit Florida. That will give us plenty of time to decide if there is a need for it in our communications repertoire. There are several options out there through both Iridium and Inmarsat to get “broadband” internet on the boat. However, the equipment is extremely expensive and you can get speeds ranging from 150kbps to 432kbps (using Fleet Broadband). For reference, I just ran a speedtest on our home internet connection and we have a 16Mbps connection. So marine “broadband” is rather relative and we certainly wouldn’t be streaming the soccer matches over our internet connection. The only real reason I could see us going for this is if we decide we absolutely must have a decent internet connection while at sea and can’t wait to connect to wifi when we get to land. I just don’t see that happening. Helia 44 – 1 Giant Leap. We are in Vanuatu after 4 mths in the Pacific. 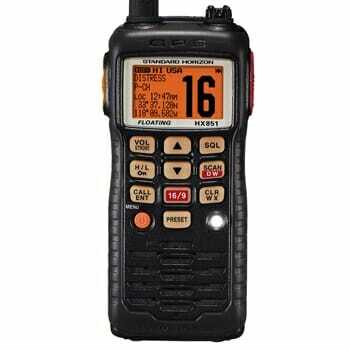 We have VHF and InmarsatPro Satt phone for weather. Our experiences now have led to a modification of Comms preferences. VHF and Iridum GO WiFi router for use with the iPhone,iPad for weather downloads. In the Pacific we have found the Inmarsat data quite problematic. 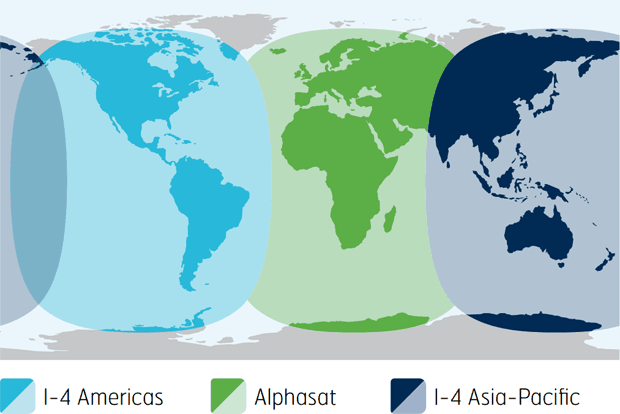 But the Inmarsat coverage in the Pacific is their worst coverage area. It is much better around continental USA I am told. As a voice only phone, exceptional. We feel very socially isolated round here without an SSB. Everyone stays in touch and meets up via SSB. Not necessarily with the Pacom modem (satt phone is so much cheaper in terms of setup and easier) . Heaps of information is avalible round here on SSB as all the remote islands communicate via SSB, and there are scheds that provide great info such as anchorages and dive sites. This is my 2 cents worth! Thanks Tim, I think that advice is worth far more than 2 cents! Since we plan to eventually make our way to the Pacific, I’m glad to hear that Iridium is the right choice. I looked at the IridiumGO, but decided that I wanted a pure sat phone and I wasn’t wild about being an early adopter for a service that will be pretty vital for us. As far as the SSB, I think the social aspect of it will play a huge part of our decision, but that’ll be something we deal with when we get to Florida.